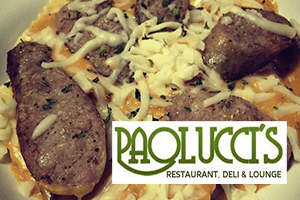 Paolucci’s Restaurant offers American food, Burgers, Delis, Hot Dogs, Italian dishes and Sandwiches. Family owned and operated. Full Bar & Food Catering available for any occasion. Banquet room available for Private Parties. Lounge available for large groups and reservations. Saturday and Sunday with a Breakfast Buffet. Dominic and Rosa had three sons, Nick, John and Felix and one daughter, Mary. Nick, John and Mary stayed with their parents to help run the store, while Felix left Atchison to pursue a career in the Navy. In 1936, Mary Paolucci married Ed Begley, and created what is now known as Paolucci & Begley Grocery. Mary and Ed had four children, Rosemary, Ed, Joe and Mike. Rosa Paolucci passed away in 1958, leaving the store to Nick, John, and Mary. Mary’s youngest son, Mike Begley, joined the family business in 1970. Mary J. Begley died on October 2, 2000. Paolucci’s Restaurant is proud to be celebrating our 33rd anniversary in 2016. As you can see, our ties to Atchison go back much further, and we hope that they last much longer. We thank you, the people of Atchison, for giving the Paolucci-Begley family the opportunity to be part of this great community.